The San Millán Yuso and Suso Monasteries are known for their role in the development of the Spanish language. 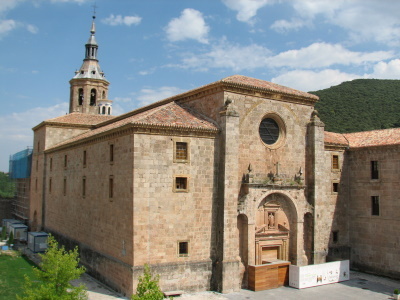 The twin monasteries are located in San Millán de la Cogolla in La Rioja. They owe thier existence to the holy man Millán, who settled here in the 6th century and founded the first 'monastery' at this spot. Suso is the older of the two monasteries, and it is the site where phrases in the Spanish and Basque languages were written for the first time. A monk had put annotations in Spanish and Basque next to a Latin text. The codex in question was subsequently preserved in the monastery library at Yuso before being moved to its current location in Madrid. Yuso monastery dates from the early 16th century. 'Yuso' means 'below', while 'Suso' stands for 'upper'. Yuso Monastery is an impressive complex when you first arrive. And popular with the tourists as well. Entrance is only via a guided tour, which costs 4 EUR. The tour (with ca. 40 people) lasts about an hour. It’s a tiring affair to non-Spanish speakers, as the guide will stop often for long talks. It will take you through all the important rooms however. Especially the Sacristy is a feast of paintings, furniture, frescoes and a golden altar. The church is under restoration at the moment, and all the decorations are packed in paper (as if the artist Christo had stopped by). Yuso’s older sister, Suso, is located uphill. When you’ve bought a ticket, a bus will take you there to go on a guided tour. What’s left of Suso is only the church. So it’s only one room, quite tiny. This guide also starts a long story before we can enter the building. No photos are allowed inside, but this is not strictly reinforced. The interior is almost empty, except for graves. What I liked most was the medieval graffiti at the outside of the building. 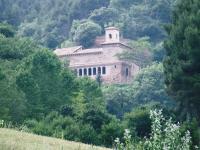 I stayed overnight in the ‘Hosteria del Monasterio de San Millan’, which is located in a wing of the Yuso Monastery. It’s one of our ‘Hotels in Historic Buildings’! The long hallways give it away that you’re in a monastery. I guess the hotel is quite new, the room at 60 EUR was pretty modern and luxurious (it has a bath, minibar and Wifi!). The hotel restaurant gets a definite thumbs down at Tripadvisor, and also their breakfast is overpriced at 11 EUR. So I skipped both and only stayed for the night. The village of San Millan does have at least two other restaurants at the central square, which seem to be open while the tourists are there (until 7 p.m.). I ate a good value menu at the more upscale restaurant of the two. I visited this WHS in August 2014. After some reading and research I decided to concentrate my visit mostly on the Yuso Monastery which is the bigger one of the two. It costs 6 euros to visit and we were accompanied by a Spanish guide throughout the visit. A leaflet in English containing the gist of what she says in Spanish is handed out but it isn't really all that necessary. The Yuso monastery houses the first verses written in the Castillian language so it is an important national cultural site apart from being a WHS. The church cloister and gilded furniture are nothing out of the ordinary compared to other WHS I've seen. The sacristy though is beautiful. The Books of Gregorian Chant weighing up to 80kg were the highlight of my visit. Two treasures worth seeing are the boxes/chests decorated with the original 12th century ivory plates of San Millan intricately carved and in very good condition. The exterior is worth a quick photo mostly for the serene environment surrounding the Yuso monastery. The Suso Monastery is very small compared to the Yuso Monastery and there is a shuttle bus that takes you there and back every 15 minutes departing from in front of the Yuso Monastery. Entrance tickets (inclusive of shuttle bus service) are sold at the Yuso Monastery. I enjoyed my visit as another stopping point on my return road trip from Portugal but it's definitely not one of Spain's best WHS in my opinion. My husband and I are, at present, staying in the Yuso hostelerie. We have done the tour and visited Suso this morning. We walked back through the woods glimpsing deer on the way. It is Sunday. Staying in a monastery we looked forward to daily Mass and special celebration today but no............. we will have to go to the chapel in the village since no mass is said in church - at least not for visitors. What a terrible waste of resources.Such atmosphere, such history and the centre of it all ignored! The village of San Millan de la Congolla was picturesque and set in an amazing landscape. I reached it by a bus that travels there in the afternoon from Logrono via Najera, and returns in the evening allowing several hours for a visit to the Yuso and Suso monasteries. 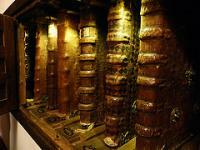 I found the displays of the earliest books in the Castillian language in the Yuso monastery very interesting. Because the bus to Suso was not operating on the day of my visit I hiked up the hill through the forest to see this ancient building. The spanish language started in these monasteries. The most ancient document with some different words (not latin) are from here. Important cultural site for the spanish language/people. Interesting only and should be visited if you are nearby. Historical Graffiti: Suso: "the walls of the atrium are covered with graffiti written by pilgrims and monks in the 11th and 12th Centuries". Founded after Animal Miracle: Apparently when the monks had laid the remains of the holy man San Milan on a cart, the oxes who were pulling the thing refused to do their work on a certain point and could not be made to continue. It was seen as a sign and so this point was chosen as the spot where the new monastery was to be built.